Multi-coloured, laminated menus in light boxes on mustard walls say Panini Sandwiches – half $3.49, Breakfast Sandwiches $2.99. How many times have you said that you wish you could order half, or you arrive at your local eatery at 11:01 am and they stopped serving breakfast at 11:00? At Bite & Sip breakfast time is anytime. And, it’s encouraged to order half the sandwich. It’s right there on the menu. You can add ginseng, protein or bee-pollen Kicks to your non-dairy, real-fruit smoothie or the sweet Pumpkin Pie, Oreo®, or Chocolate Peanut Butter smoothies, for .99 cents, depending on the mood of your snack attack. A girl could get lost in all the goodness of the fresh Veggie Max sandwich and assorted salads, grilled paninis, Mozzarella Cheese with Spinach or Pecan Salad crepes, and even the home-made chocolate chip cookies, but I went into the corner-store fashioned restaurant because I spotted the illusive baseball stadium, New York City style pretzel sitting in the window or so I thought. What I found was a chewy-crunchy German pretzel hand-made fresh from scratch by Milka, and I was lucky enough to try right out of the oven. It’s rainbows above baseball park pretzels. She stands in the window, separated from passersby on the Bloor Street sidewalk by only a very transparent windowpane. The entire pretzel-making process is on display, the pouring of the flour, the kneading, the rolling of the dough, the twisting, placing it in the oven, removing it, and smothering all sorts of loveliness all over the hot, fresh pretzels, ready to eat. If no one’s there to grab them, they are then placed in the window to grab the attention of hungry shoppers like me, or David, who says Milke’s pretzels are “the best pretzels he’s ever tasted,” better than what he’s tried in Belgium, where he’s from, than in other parts of Europe or even Australia. Who knows if he was telling the truth? But, he was certainly enjoying them; yes, he had two. Note that a pretzel the size of your head is not really a snack to begin with. 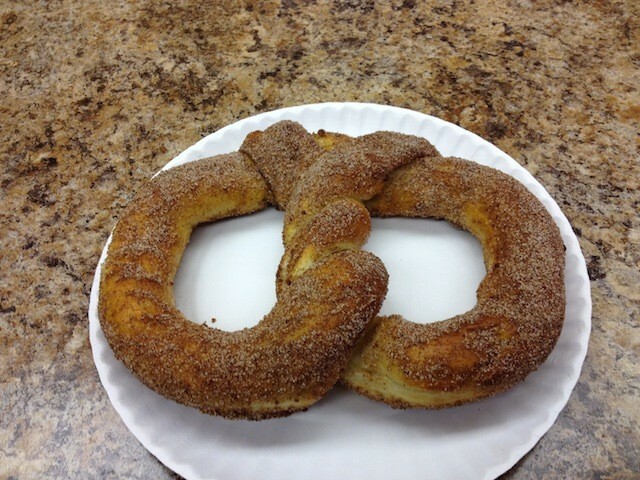 Bite & Sip pretzels are $2.49 and come in Plain, Salted and Cinnamon Sugar flavours. “Then there are made-to-order items like cheese pretzels, pretzel dogs, pretzel bits and vegan pretzels,” says Milke’s daughter’s friend, who wishes to remain nameless, at the cash register. Milka says, “You want to try the Salted one too? Try it. You’ll love it,” in her home accent and she sounds like she’s 16. I try it and the thick granules explode on my tongue, melt and disappear into the soft, warm, crunchy freshness. It was almost, but not quite as nice as the Cinnamon with its sugar and spice.